It’s part 3 for Dimension Police bringing dawn of metal mayhem. This story begins with Super Dimensional Robo Daiyusha all the way back in Demonic Lord Invasion, and his female partner Super Dimensional Robo, Dailady coming into play with Booster 05 Awakening Of The Twin Blades but it wasn’t until Booster Tech 08 Blue Storm Armada, which is where we started in our last part (Zeal), that Dimensional Robos as a deck began to take shape. This is going to be a big one so let’s Gattai! The Galactic Beast Zeal proved to be too much for Enigman Storm to defeat so in typical superhero fashion a bigger monster calls for a bigger hero. Rescue Yusha 02 – Dimensional Robo, Daibattles is a Critical Trigger that comes equipped with a skill accessible only when in the soul, he’s not going to end up there unless you use Goyusha‘s skill thus the deck actively prompts you into using the superior ride as part of the main play pattern. escue Yusha 03 – Dimensional Robo, Dailander a Grade 1 that shares the same chassis design as Dimensional Robo, Daibattles but forms instead the left arm of Super Daiyusha, and for some reason sporting twin vulcan cannons that happen to provide shield mounts for gestalt mode, further differentiation coming from his skill which takes place when coming into play on the board which is an Archetype locked variation of the skill of Cosmo Beak for half the the cost of the original. Just saying I I get the impression Daibattles and Dailander were printed onto each other’s card and then it just sort of stuck. I’d expect Battles to be the one with the guns- but I digress… where was I pre-tangent? Oh yeah- this guy is your on play live crit Daisyuaha Token, that’s what. Rescue Yusha 04 – Dimensional Robo Daimariner takes up the second Grade 1 spot and the intended Grade 1 Ride of the deck with having the same skill has Daibattles to his name. This sea faring rescue-yusha forms both legs of Super Dimensional Robo, Daiyusha. At this point we have all the body parts we’d need for a super robot but we have no weapons- yet. Rescue Yusha 05 –Dimensional Robo, Daidragon is a 9000 power base Grade 2, but if your vanguard is a Dimensional Robo, which is ought to be given that’s the deck theme, then as a rearguard this guy is suddenly a 12k Beater. With even a 6000 power Grade 1 behind that you get an 18000 power lane. That’s a lane that can hit a cross ride which is important to note as during the time of this deck’s debut Crossrides were in charge of the meta game. In terms of Gattai Dragon gets the short straw, his head and tail are taken from his body to give Daiyusha his sword and shield while the rest of him provides Daiyusha‘s back pack, impressive silhouette buff but I reckon Daiyusha could fly even without those wing, would certainly make ariel control more stable though. All five components unite form Super Dimensional Robo, Daiyusha but with this deck the heroes power can go even further. Remember that Cross Ride I mentioned? Ultimate Dimensional Robo, Great Daiyusha! Armed with a cross ride bonus when Super Daiyusha is within the soul for a +2000 power base above 11000. That’s 13000. For quick note, when you’re on Super Daiyusha a pump from Dailander (or Cosmo Beak) puts your vanguard at 14000 marking a 7k booster as a partner to enable a 21000 power lane push, so at 13000 power this leaves the X-Ride falling just a little short of that next stage. Enter Limit Break because yes, this cross ride comes with that. At 4 damage or greater and with 3 or more Dimensional Robos in soul Great Dai will forever hold a built in bonus Critical for 2 critical pressure base, this critical coming along with an additional +2000 power. That’s 13k attacking even if you miss cross ride, though in that scenario truth be told you won’t even have 3 Dimensional Robos in the soul, at most you’ll have 2, so if you miss cross ride this card is relegated to being pure vanilla. So long as the deck plays as it wants to though this unit reaches 15000 power solo. Yet if this deck is wishing to take on cross rides by beating them at their own game then in order to kick into the third shield stage against an opposing X-Ride, the threshold for which is 23000, then Great Daiyusha is going to need to have himself an 8000 power boost, though a boost from a 7000, or even 5000 power rear plus a ramp via skill to cover for you. The deck evolved further during season 3 but before pushing onto when the deck could achieve 100% archetype consistency quick count. At this point there’s 8 types of Dimensional Robo. 5 Rescue Yusha two Daiyusha forms and then there’s Dailady given all of these but the starter would be run in max playsets, though doing this with the cross ride is debatable then that marks 29 Robos in the deck. The remaining support in the deck are carry overs from the Enigman Storm build with maybe the self damagers, Flying Saucer and Cosmic Mother ship tech in. The tech slots inserts varied on the player handling the deck. Zeal won the battle all the same when it came to what deck would rep the clan during the course of Season 2, more costly but more consistently able to bring down opponents into punching range, come season 3 though Dimensional Robos would at last claim that rep crown and all it took was a Break Ride. Trial Deck 12 Dimensional Brave Kaiser reprinted all Resuce Yusha members except Dailander but bought enough new recruits to shift towards a full Robo deck, excluding Perfect Guards, which was quickly remedied by the following Booster Expansion. The Trial Deck added a rainbow set of Robo Triggers (reprinted Daibattles as the deck’s critical Trigger), an alternative Grade 1 ride target to Daimariner called Dimensional Robo Daibrave, with support Grade 1 beater called Daitiger to go with Daidragon. There was a Grade 2 10k vanilla for the archtype named Daifighter and a grade 2 equivalent to Dailander bearing the name Daidriller, the two Grade 2’s seemingly having a relation to each other but it is never elaborated upon. It is unquestionably though that what put this division of Dimension Police on the map was the main event centrepiece break ride that the deck included 1 copy of. A break ride unit with the powerful ability to destroy Guardians and in doing so nullify perfect guards, this while packing an extra critical into your swing. The deck’s final turn image thus becoming a devastating 3 Critical attack during which you could potentially nullify any resistance that an opponent put up, a threat that prompted opponents of the deck into dedicating double perfects just to prevent these fatal blows making contact. This Break Ride remains active even to this day where as most have been outgrown and faded into irrelevance, in fact it has seen play in EVERY top Dimension Police build ever since it was released, a testament to how powerful it was and still remains. 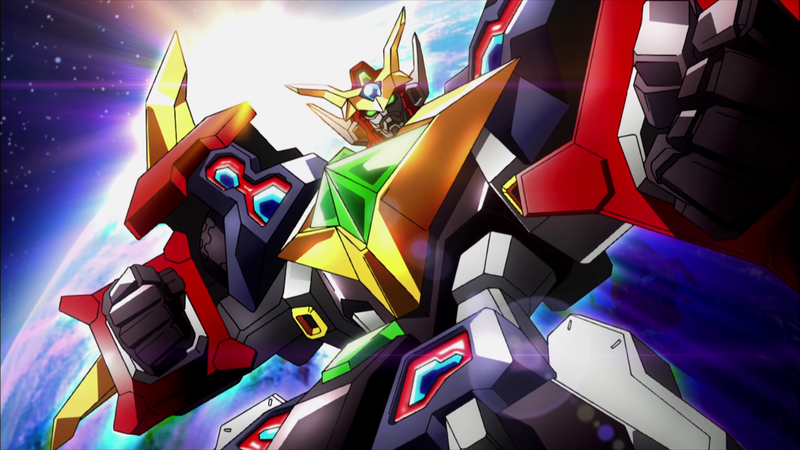 Daikaiser also had a Grade 2 form within the Trial Deck named Dimensional Robo Kaizard, a core mech who forms the central body and brains of Daikaiser, but his card printed text skill doesn’t mix well with his Grade 3 form, other than just being an automatic additional stage of power single handed for whatever unit rode atop him, but this didn’t really have pressure unless there were criticals loaded into that attack, which meant riding into Super Daiyusha, contradictory to the order in which you wanted to ride the two Grade 3 targets in. In any case the Robo deck now had it’s completed image, one that would stick and evolve as the deck entered maturity and aged along with the game. The following expansion didn’t really add much else of major impact for the archetype now full blown sub-clan except for an alternate cross ride for Daiyusha and the previously mentioned archetype Sentinel; Dimensional Robo, Daishield. Though if you fancied a change of starter from Goyusha, who came supplied with the Trial Deck, then Booster Tech 13; Catastrophic Outbreak did also offer Dimensional Robo Daimagnum. His use took away from the grade acceleration that Goyusha offered but he was generally more usable and stable in a wider range of scenarios effectively putting Goyusha on the shelf if the player’s focus was on cost efficiency. There’s Dimensional Robo Gannon in the set to but aside from being a possible reference to Brave Express Might Gaine’s Max Gunner character we don’t talk about him, -2 cards of resource for an extra critical is bad exchange. Then there was the “replacement/upgrade” to Goyusha named Daiheart and this time appearing as a Grade 2 instead of Grade 1 but we REALLY don’t pay attention to him. That’s a lot of units named with little details given but I’m going to take a moment to focus on Daibrave for sake of explaining the interaction it bought to the table if it were used along side Goyusha or Daimagnum, it’s the same situation in both examples as while in the soul, Daibrave can be ejected to grant an on vanguard hit +1 card draw for the duration of that same turn, thus mitigating the cost of either Goyusha or Gocannon slightly, while also being a chance for soft advantage if it were initially ridden. The only down side being a counterblast 1 cost attached to that and this was a time at which the deck was starting to become rather counterblast hungry. Only singular costs here and there each asking for 1 damage to be flipped but that eventually adds up when you’re working with only 5 costs you can pay, outside of healing to have yourself a sixth chance for paying a cost. As such these counterblasts were often reserved for your big plays be that break ride spam or using a ramp to push into the next stage of guard on one of your lanes, both cases representing plays that were dedicated towards pushing for the game, prioritising offence over defence. Never the less Daibrave appeared as a standard inclusion for many players commanding Robo decks. Yet the most interesting deck from this time was a build that debuted under the name of Crazy Diamond. The Pioneer for this deck was a Japanese player named Niida Kazuki who reportedly became Japanese National Champion of the juniors division with the list by accident. You’d look back at this list now and probably scoff slightly at how inconsistent it may appear but remember that the Enigman Ride Chain so long as you hit the Grade 1 assured your ascent up the grade ladder and having almost as many grade 3 as triggers is no joke when you consider that when Daikaiser is involved those grade 3 are more powerful than any trigger when drive checked. The biggest advantage this deck held though was the element of surprise, no one had seen anything like this before and thus no one was prepared for it. This list was made before Catastrophic Outbreak’s release and before Link Joker became a prominent threat but even after the expansion, the infamous Chaos Breaker wouldn’t have been an issue due the deck being able to get away with not providing any targets to lock until after it had already made it’s play. The down side to this strategy is that you give the other guy a chance to reserve their hand so that it is plentiful and able to hold up against the push but it was an action that was available. Seat B on the champion team of Mexico early in the season, pure archtype list pre-Outbreak. Seat B among the Ireland regional runners-up, pure archtype Invaders List post Outbreak. Seat B on the England Runners-up team with an archtype focuses Invaders List. Shadow Paladin, Nova Grappler and Kagero respectively. With new robot overlords bearing the colour blue ruling the robot kingdom, Dimensional Robos, and DP altogether was sidelined into a rogue slot settling into the era’s Tier 2 Meta. Though Team S.B. ANARCHISTS the Birmingham England runners-up did manage to Invade Europe as Agents of Reverse- their Seat A, previously Seat B, William Adams, still piloting corrupted justice all the way to the finals, a face off that the team ultimately won. The list used between England and Europe remained unchanged. It would be the last triumph for the clan until Legion Era and it wouldn’t be even be Robos flying the flag, even with Daikaiser getting further support at the dawn of the era in the first English available Fighter’s Collection with two cards. Super Dimensional Robo, Shadowkaiser as a new upgrade partner to form up with again through a thematically appropriate superior ride skill, the resulting Gestalt X-Ride birthing Ultimate Dimensional Robo, Great Daikaiser. The first unit in the game to feature Triple Drive but it failed to make significant impact, part of this was due to Legion overtaking Limit Break and just being more powerful, another part of this being counterblast consumption. The X-Ride’s Limit Break requires 2 Counterblast, further more these have to be Robos, this is while trading in an additional Critical from previously available ride targets which might net you the lethal level you need for an extra opportunity to break guard. Meanwhile in the same Fighter’s collection there was a third unit much easier to obtain and much more useful unit that worked well with Dimensional Robo, Kaizard to hit reach 16000 +Crit. A spiritual successor to our boy in blue, Super Dimensional Robo, Diard. Same skill as both Enigman Storm and Super Daiyusha (boy in blue) but with an 11k base instead of 10. That’s not even the Limit Break as that is a built in Superior ride that can also happens to gift power +4000 to the ridden unit while due to the cost for using it sets up the user for X-Rides whether that be Blue, Black or Red. As it happens there’s a lot of black where we’re going next. So excuse me while I take a break to paint my red door to match. Before moving on though there’s one little details I must fill in. In part 1 of this retrospective I said we’d be starting from Zero. At the time that was joke as it could refer to either a Grade 0 or the card named Original Saver, Zero. His visage is shown as the featured image at the head of retrospect part 1. He was a Break ride that was included in Catastrophic Outbreak but instead of breaking guard like Daikaiser his bonus cut 5000 power off an opposing vanguard. In comparison to the unit he was in competition with he never stood a chance. I see a line of cars and there’re all painted black, and if I don’t take leave now I may not be back. A voluntary contributor to the Coalition.